Car batteries are one of the important components which power all the electrical components, your car’s headlights, stereo, and your car itself. The starter motor draws power from the battery and the spark plugs get the power from the same source. That means without the battery, your car wouldn’t simply start at all. But that is to say, like all the things in the world, batteries can go back after some time of use. Although car batteries are rechargeable and made to last for many years before needing replacement, they lose their charge to a considerable amount and that’s when they need to be replaced. But there are now many tools and equipment which can help you determine the status of your battery and how much life it has got in it. Often times you get stranded in the middle of nowhere with no mechanics nearby, all due to a bad battery. If you’ve had known that your battery was losing its charge, you would have changed it before using your car again right? Well, with the help of battery testers, you can do just that and the best thing is you can do it all by yourself with little precautions and safety measures. 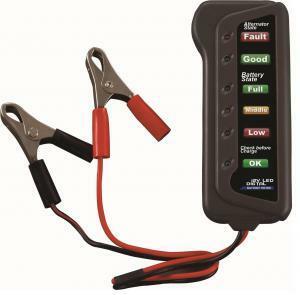 Down below you will find the best car battery testers & analyzers you can buy for your car so that you no longer need to find yourself in a difficult situation and you can prevent it way beforehand in case of bad batteries. 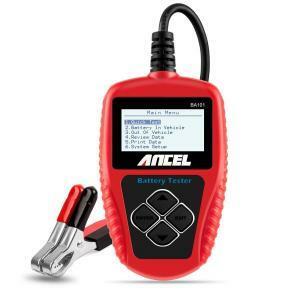 If you want to learn a bit more about car battery tester before purchase, check in the bottom of the article or click here. 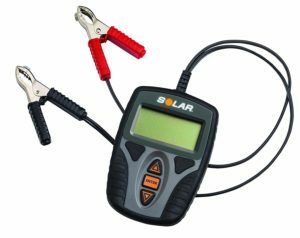 Solar BA7 is a device which will help you test batteries of many different kinds. You can now easily test lead batteries, acid batteries, gel batteries, AGM batteries and even more. Its compact design makes it easy to handle and use. It’s shaped nice so it tucks in nicely in your pocket. Carry it anywhere with you. Its working range is between 7 volts to 15 volts and batteries with a rating of 100 CCA to 1200 CCA. The fact that this particular device is so handy and can fit inside your pocket is why most people want this device for themselves. Who wouldn’t want a device they can carry anywhere with them? This device includes a guide on how to use it and features protective measures like overload, polarity, and high voltage so that the device doesn’t break so easily. Solar BA7 is backed up by a 1-year warranty. This product is very lightweight, weighing only about 0.6 pounds. The solar BA7 can diagnose batteries of 7 volts to 15 volts and those with a rating of 100-1200 CCA as we mentioned earlier, which gives it some level of being dynamic. Along with accuracy and safety features, this product becomes a good choice as it’s easy to use and most importantly safe. It is fitted with an LED which shows the status of the battery using different colours as well as numbers to accurately state the charge of the battery. While Motopower may not be known by those who normally don’t like to diagnose their vehicles themselves, many enthusiastic and professional are familiar with this brand. It’s one of the well-known battery tester makers. Their device is of high-quality and gets the job done just right. The MotoPower MP051A is digital testing equipment designed to give out accurate results. There used to be analog testers long before but now the digital era has taken over and Motopower takes advantage of that. This tool is equipped with a digital display and works perfectly with 4 volts to 20 volts. Any volts below or higher than the stated will simply display a Hi or Low depending on the range. It’s also equipped with an LED which changes colors according to the status and health of the battery. 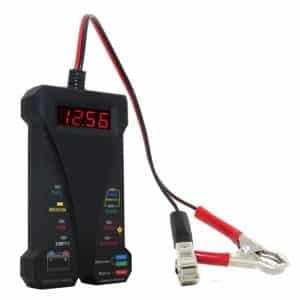 Being a digital battery tester, people often challenge its accuracy but rest assured, this digital tester will prove to be as accurate as analogue testers. The display on this device has room for four digits for greater accuracy and features short circuit protection, reverse polarity, and overload protective measures. Multi-coloured LED to accurately show the status and health of the battery. Sits in a rubber housing for greater grip and shock resistance. This device is designed to be simple yet accurate. With an easy to use interface, detailed diagnostics, and safety features, this product proves to be one of the best-valued battery testers for one to get for their car battery or other batteries under the range of the product. It is true that reliable, solid and robust car equipment is difficult to find these days which lives up to its high claims. But we assure you that OTC won’t let you down in this matter. There are many expensive battery testers in the market which don’t really deliver much for the price tag. But OTC 3181 battery tester is one of those devices which delivers what it claims for a reasonable price too. Not just that but OTC is one of the leading manufacturers of this battery equipment and has a good reputation in the market. To say it simply, OTC has made this device heavy duty and to output the highest accuracy in terms of battery diagnostics. That is what gives it a good name in the market and amongst the people. OTC has upgraded this device to comply with more heavy use and due to its ergonomic design, it’s easy to use and convenient to carry. The 3181 heavy duty battery load tester will give you the results in just about 10 seconds so yes, it’s a quick one. In terms of terminal gripping, clamps are equipped which can hold the terminals of the battery tightly to get you the most accurate results without any sparking. The cable is heavily insulted at till the clamp ends to remove the hazard of handling it barehanded. This unit has a big display for you to easily see the battery results with the added function of zero regulate which ensures the maximum accuracy. With its firm gripping clamps, zero regulate feature an ergonomic design, the OTC 3181 proves to be one of the worthy devices to buy. This is another device by Solar which is a lower variant of Solar’s earlier mentioned device. Since Solar has been in the industry for a very long time now, it knows what the people are looking for. This unit is close to perfection and aimed towards do-it-yourself people and car enthusiasts. This unit works best with 12-volt electrical equipment and not only that but also car alternators, chargers, and other items. One of the great features of this unit is that that this unit works perfectly with various types of battery of different brands out there. AGM batteries, gel batteries, and winded batteries are all covered by this device. 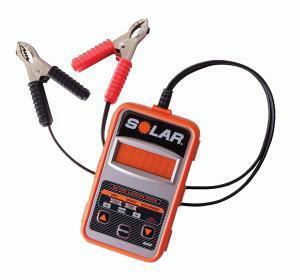 The Solar BA9 can check and diagnose batteries ranging from 7V to 15V and 40 CCA to 1200 CCA. It is equipped with a convenient and clear LCD which clearly shows your accurate results. Also with this unit, comes all the safety protection features like overload protection, reverse polarity, and high voltage protection. Easy to use and ergonomic device. A clear and vibrant LCD for you to see the results as clearly as possible. This unit features a big enough display with is simply clear to read. There are 2 more wires from the clip on from both the polarity wires as the connection needs to be firm to have the unit to provide accurate readings. The menus in the device are very clear and denote what functions they perform. Besides displaying in CCA, this unit also displays in mega ohms, allowing it to be used for other applications other than the car battery. Schumacher BT-100 is a mid-range and a cheaper alternative to more expensive battery testers out there in the market. Schumacher too is a name that has been in the industry for quite some time now and has introduced high-quality products in the market. The brand has earned a name for itself due to many of its successful devices, one of which is the Schumacher BT 100 which has been named for professional use even, even though it’s priced low. It is surely a must-have device in case of a tight budget and even more, mechanics prefer to use this device professionally. Schumacher BT-100 will work just fine with batteries of 6 volts to 12-volts and can test a load of a 100 amps maximum for 12-volts and a 50 amp load testing ability for 6 volts batteries at a 1000 CCA. This device has a coloured chart denoting a scale. As you give it a signal, the needle will go up on the chart which will tell you the reading. The chart is divided into 3 colours, red yellow and green. If the needle lands on the green part, it means your battery is good. If it lands on the yellow part, it shows that it needs to be recharged and the red part denotes that the battery is near its end and if not recharged, it might permanently lose its charge. As simple as that, you can load you’re your battery, check its status as the starter motor draws power and much more. Load testing, battery status, power draw by starter motor and prognosis of charging equipment. Schumacher also has an upgraded model of this unit, the PST 200 which features an LED display but comes at a higher price than the former. 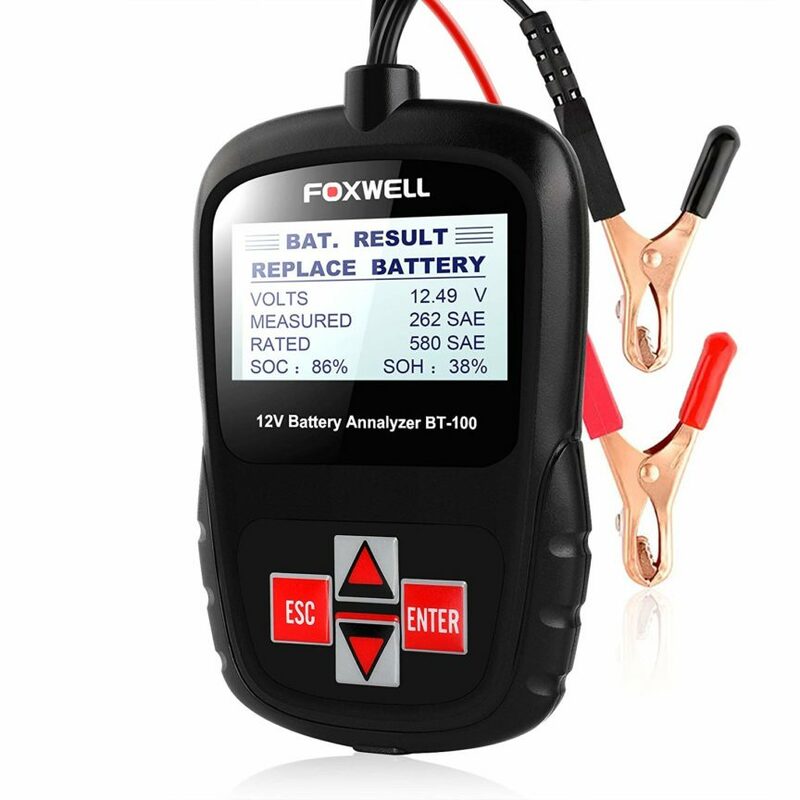 A well-designed tool, Foxwell shall deliver you excellent features with high accuracy for various kinds of batteries. It is a product worth buying. Similar to other devices, you do not need to take the battery out of the car to test the battery as the device is very much portable and testing can be done while the battery being used. This unit can test a battery of 100 to 1100 CCA and provide you with the most accurate results and readings which is why so many people have fallen in love with this unit. This unit is quick enough to deliver you the results under 3 seconds. Features multiple unit systems such as BCI, CCA, CA, MCA, JIS, DIN and more. Displays accurate results in only 3 seconds total. Support for many languages other than English such as German, French, Polish Italian, Portuguese, Russian, Spanish and Chinese. This little unit is very easy to use and shows accurate results in multiple unit systems. It can tell you if your battery is healthy or going bad to save you trouble beforehand. It also works with many different battery types. This is an affordable unit you can use to test your battery. If you are looking for an accurate, reliable, a robust and a budget-friendly car battery tester, well you need to look no further. Ancel BA101 is highly accurate, reliable and just the device you are looking for. It’s so compact that you’ll have no trouble keeping in your pocket, taking it everywhere with you. The features are good and the device itself is nicely made with a straightforward and simple design. The greatest thing about this device is that it’s so easy to use and user-friendly that even people without technical knowledge can use this unit to test their batteries. This unit will work perfectly with 12-volt batteries and give you the diagnostic results as accurately as possible. From the status of your battery to the amount of charge pull, Ancel BA101 will get all of this done for you. Looking at its technical specs, the BA101 is one of those units with a testing range of 100 to 2000 CCA. Ancel goes as far as to claim that this unit is more accurate than many similar devices in the price range which is a big claim but the unit really does live up to it. pulling power and battery health. It can also calculate the resistance. Features a wider checking range of 100 to 2000 CCA which is greater than what many testers offer of the same value or even greater value. Provides information on the alternator, the charging volts, starter motor pull, voltage load, ripple charge status and overall charging status. Features a large LED which is vibrant and clear to read and doesn’t need external batteries to power it. It pulls the power directly from the 12-volt batteries it is testing. This unit includes a long 3 feet cable which is constructed from a thick and flexible insulator which makes it very secure to handle. It is backed up by a 2-year warranty. Besides just analyzing the battery, this product can be used to check power readings on the car’s alternator as well as the starter motor. You can view your results clearly on its bright and vibrant LED display with a backlight for you to be able to see in the dark as well. Not many testers come with a cable this long. 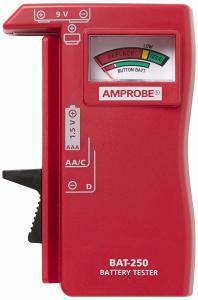 Amprobe is another brand that has been in the vehicle industry for a long time. The reason for that is pretty simple. They deliver what they claim and they have a battery tester for you that will get your diagnostics and testing job done in no time and quite accurately without creating any mess at all. So if you are looking for a reliable battery tester that is low in price but high in quality and accuracy, this basic device will prove to be useful. Amprobe BAT-250 has been modified for some improvements which have made the reading a lot less complicated. This unit has a slider to test smaller batteries which sit firmly in the space between the slider. This unit also features a colour-coded chart scale with red yellow and green colour denoting bad, okay and good battery respectively. The green means your battery is healthy, yellow shows its time you recharge it and red means you should better replace it. This unit can be used to test many other batteries such as 9V, AAA, C, D, AA and 1.5V Button Type batteries. Can test smaller batteries commonly found in household items such as AA, AAA and button batteries. Features a side cradle to help firmly hold the battery in place firmly. Features an ergonomic design that gives great grip over the device. The BAT-250 Battery Tester is compactly designed to be used with a single hand to improve usability and its V-shaped cradle keeps the batteries firmly in place which simply makes battery testing a whole lot easier. The features you can get in the price range is good enough which makes this unit a great buy so it can be safely said that to test your batteries with ease and accuracy, the BAT 250 is the way to go. On your journey to finding an accurate, easy to use and a low priced battery tester, you will come across the cartman 12-volt battery tester. That’s a sign your journey is over as you need to look no further. You can rest assured that Cartman has all your battery testing needs catered because this unit will take care of the diagnostics of your alternator as well as other charging equipment. 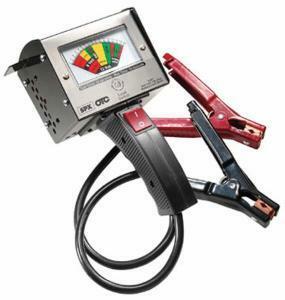 Cartman has made this unit a reliable, sturdy and accurate battery tester which will not have you get your hands dirty In the event you are seeking out one of the great units there’s in the marketplace, trying to access the alternator to check the readings. After you get this device and learn proper use of it, which isn’t any difficult by the way, you will now never need to visit a mechanic or pay for getting your batteries checked up. You will only need a mechanic when you need to replace the battery. As this device is very easy to use, you can easily find out your car battery’s status that will let you know if you need to change it. Doesn’t matter if you are a man or woman, you can easily learn to use this unit with the help of its provide usage guide, having you learn about it completely in little to no time. Features alternator testing, charging volts, load before starter pull and reading after starter pull. With its convenient LED display, you can easily know the status of your battery as well as your alternator. It can also show you the charge in percentage. The LED display proves to be much easier to read than the analogue scale. This unit performs best with 12-volt batteries although it can work with lower voltages too. Last but not the least, the TT TOPDON is another one of the battery testers which work with 12-volt batteries having a load bearing of 100 to 2000 CCA which actually makes it a good battery tester for load checking, battery quality and status and charging status. 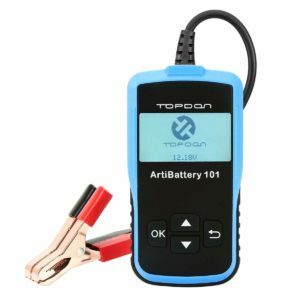 Topdon battery tester will save you from an emergency situation by showing you a correct status of your current battery in your car so that you can take the necessary steps beforehand. This unit is designed to be a multipurpose device which can be used to test a number of different battery types and easily get you the results and make clear all the potential problem there may be with the battery. No matter what type of batteries you need to check, Topdon will do the job quickly and accurately saving you a trip to the mechanic if your batteries turn out to be just fine. Only one drawback to this unit is that it doesn’t feature the safety cutoffs other than reverse polarity safety, which is now common in almost all the battery testers but that’s all you are going to get with that price. Reverse polarity safety feature included. Easy to use and read the results. A car battery is a simple yet a core component of a car as it’s needed to power the car and all its electrical parts like the lights and even the engine. It is basically power in bulk. Keeping in mind that battery itself is an electrical item, it can prove to be dangerous if not handled with care. Extreme precaution is must when dealing with batteries whether acid ones or any other type of batteries of high volts. Even dead batteries can be dangerous even though they are no longer holding any charge. A battery leak may be just as lethal. Certain batteries give off hydrogen gas while its charging and the hydrogen gas tends to be highly flammable. This is why often there’s a fire when a spark is created near the terminal when the batteries are charging because of the gas. In the worst case, the battery may even explode which can be even more dangerous. It is highly advised to not smoke near a battery especially during its charging. Keeping in mind the fact that explosions are rather rare during operating on vehicles, having a battery blow up is nonetheless dangerous as batteries contain acid. Acid is definitely not skin friendly so it’s wise to put on safety goggles, gloves, and a long-sleeve shirt. The acid should be properly contained, but by no means tip the battery over or keep it the wrong way up, and be very cautious if the casing is cracked. Car batteries are usually quite accurate but with so many units out there of many different brands, each one has some benefit over the other. Some provide more features at a higher price while other brands keep the features and price at a basic level. Nonetheless, it is not a loss to buy and keep a battery tester with you, according to your needs and budget. One will definitely come into use.